TRANSCONNECT® BIPRO MAKES YOUR IT LANDSCAPE SUITABLE FOR BIPRO! BiPRO e.V. is a vendor-neutral organization of the financial services industry in which insurance companies, distribution partners and service providers have joined together to optimize business processes across companies. It focuses on establishing end-to-end integrated processes, and ensuring cost savings through process automation. 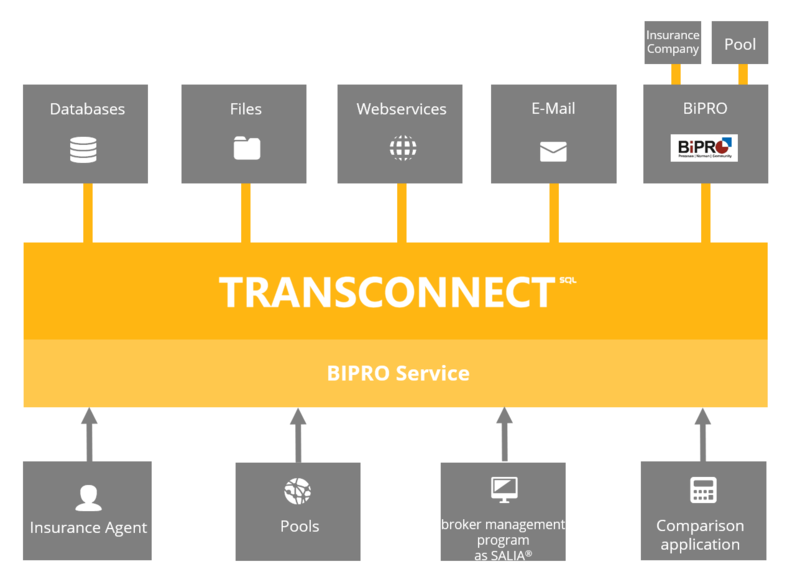 TRANSCONNECT® is a central server platform for BiPRO services in a scalable integration architecture. The universal adapter architecture, in conjunction with the SAP adapter, facilitates connecting all IT systems of the participants. Thanks to flexible modeling of transformations and processes in the TRANSCONNECT®, and mapping to the provided BiPRO interface, you can join the BiPRO data exchange within a very short time. This can be done without lengthy IT projects, and with a manageable investment effort. Adapting to changes in the BiPRO standard or in your IT landscape is just as straightforward. The BiPRO seal is awarded to top users with a significant experience in implementing BiPRO standards. These could be insurance companies, broker pools, MVP, etc., who have implemented their own BiPRO web service or a BiPRO client as providers or consumers. The seal is also awarded to service providers and product manufacturers who offer implementation of BiPRO web services and BiPRO clients to other companies as a service or a product. The ongoing work of our developers in the field of BiPRO has made this possible! BiPRO offers the following benefits to brokers, insurance agents and agencies: Operations are standardised, and data transfer is consistent across all organizations.